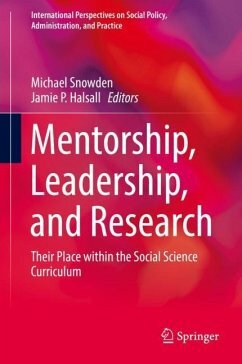 Herausgegeben von Snowden, Michael; Halsall, Jamie P.
Michael Snowden is a senior lecturer in health and community studies in the School of Human and Health Sciences at the University of Huddersfield. His research interests lie in the field of pedagogy, mentorship, curriculum enhancement, and learning. Michael is a regular speaker at national and international conferences concerned with the development of pedagogical strategies. Michael is currently the national coordinator for the flexible pedagogy group of the Universities Association for Life Long Learning and works in collaboration with the European Mentoring and Coaching Council to develop mentorship within higher education. Jamie Halsall is a senior lecturer in social sciences in the School of Human and Health Sciences at the University of Huddersfield. His research interests lie in the field of sociology of community. Jamie is currently a stream coordinator at the British Sociological Association for the Social Divisions/Social Identities. He is the book review and conference report editor for the international journal, Global Built Environment Review (GBER). Introduction.- Teaching and learning: the mentoring setting.- Undergraduate mentoring.- The employers' reach: mentoring undergraduate students to enhance employability.- Mentoring in postgraduate supervision.- Learn it and pass it on: strategies for educational succession.- Mentoring: a three-cornered approach.- Mentoring and leading within the curriculum: a synonymous relationship.- Measuring and evaluating curricular effectiveness.- Interdisciplinarity in higher education: the challenges of adaptability.- Summary and conclusions.